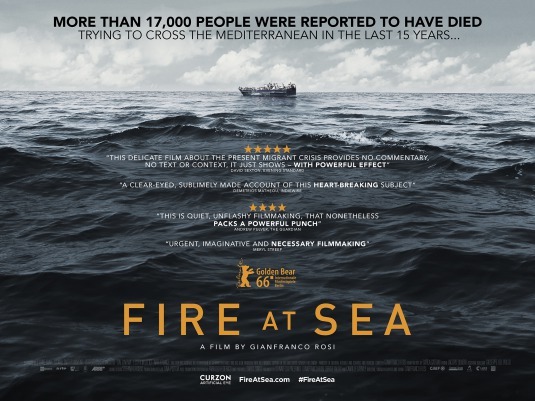 FIRE AT SEA shows how the inhabitants of the Sicilian island of Lampedusa deal with the frequent arrival of ships bearing refugees, mostly from Africa and Syria. The film juxtaposes the hardships of these desperate travelers with the mundane life of an island family. Tying the two parts of the film together is the doctor who treats the refugees as well as a young boy in the family who is suffering from a "lazy eye". The family, in particular the boy, are shown as almost blissfully unaware of the plight of the refugees. The boy talks to his father about how hard it was working on a boat and never setting foot on land for months on end, all while living in a cabin with 2 other shipmates. This is contrasted with the horrific conditions of the refugee boats, many of which arrive with large numbers of their passengers already dead. Director Gianfranco Rosi shoots his film more like a traditional scripted feature than a documentary, and the story of the island family is very much the kind of story you'd expect from a narrative film. It makes for an easy entry into a difficult subject, and in that sense may find broader appeal beyond traditional documentary viewers. But as polished and story driven as the film is, it nonetheless captures a grim reality. One that far too many people would rather turn away from or dismiss out of fear and prejudice. 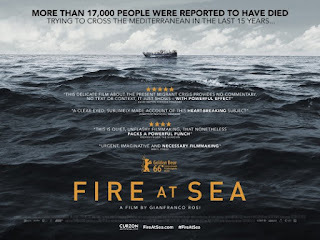 That said, FIRE AT SEA is not the sort of movie that actively seeks to persuade its audience to action. To quote director Rosi from an interview with No Film School, "We are so used to what I call “explaining and complaining” films, where it's someone complaining about something and then explaining why he's complaining about something. I want to get rid of that language because we don't need that anymore. I would write an essay if I wanted to do that." In that sense, Rosi seems a kindred spirit to Patricio Guzmán (THE PEARL BUTTON, NOSTALGIA FOR THE LIGHT) and Werner Herzog (so many films including GRIZZLY MAN and CAVE OF FORGOTTEN DREAMS), filmmakers who also take a more personal and poetic approach to nonfiction film. No doubt parts of FIRE AT SEA are heartbreaking and hard to watch. They should be. But it's also an absorbing film that offers light as well as dark. I personally wish it had tilted the balance a little more in favor of focusing on the refugees than the family, but all in all it's an excellent film. 3 ½ out of 4 stars.